The so called "secret recipes" of these billion dollar restaurants have now been exposed and shared with the world in the cooking instructional guide "America's Restaurant Recipes." 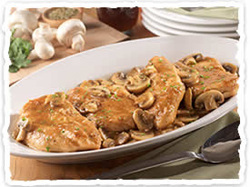 Description: Lightly coated chicken breasts skillet fried with sauteed mushrooms in a Marsala sauce. 1. In shallow dish, combine flour, salt, pepper and oregano; stir to blend. 2. In heavy skillet, heat oil and butter until butter melts and mixture bubbles lightly. 3. Dredge chicken in seasoned flour; shake off excess; saute in pan 2 minutes for the first side or until lightly browned; as you turn chicken, add mushrooms around the chicken pieces. Cook about 2 more minutes, until lightly browned on the second side; stir mushrooms. Once the second side is lightly browned, add wine around the pieces; cover and simmer for 10 minutes. 4. Transfer to plates and serve.